The Native American Church (NAC) originated out of the spiritual needs of the indigenous people who were seeking to reconnect with original religious ideals and find deeper community healing from the predatory colonial expansion of the 19th and 20th century. As a therapeutic healer, peyote has unlocked its potential within indigenous communities for over 10,000 years. In this lecture a very intimate personal perspective will be shared from a strictly indigenous point of view describing the “peyote way of life” as passed on from generation to generation within the Lakota – Sioux culture in the Native American Church. Peyote is understood as a sacrament and the all night ceremony a collective communion with the spiritual world. The ritual and its elements constitute a holographic metaphor of life. The symbolic meaning of the spiritual instruments used as well as the metaphorical expressions of the different stages of the ceremony will be touched upon. The important role that music and songs play during the ceremony will be reviewed and the interplay between the songs, mood and intent will also be discussed. The current status of supply and demand has been a pressing concern for the future of the Sacrament peyote. A unified effort of conservation and preservation has been developing to ensure not only the peyote future but also for the indigenous communities. Overall, this lecture is an opportunity for the non-indigenous audience to expand their awareness (on the technologies) of the sacramental use of peyote by indigenous practitioners. Sandor Iron Rope is an enrolled member of the Oglala Lakota Oyate (Oglala Sioux Tribe) from Pine Ridge South Dakota. 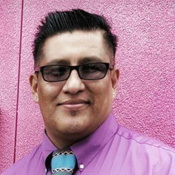 He received his baccalaureate in Human Services and American Indian Studies from the Black Hills State University in 2007. He has worked for Sanford Health Research as a data collector on community health disparities from 2007. In 2013 started working with the Special Diabetes Program for Indians as a Health technician/fitness trainer. He has donated most of his life to various Native American Churches, Family and Wellness nonprofit organizations. He has supported Tribes throughout Canada and Mexico on religious preservation. He has served as the Chairman for the Native American Church of South Dakota and the Native American Church of North America. He continues to support the conservation efforts of the sacred plant of peyote. He continues to bridge communities and promote healing with his involvement in the Fatherhood Initiatives, Cultural Educational activities.